Very recently I got around to reading Peter Pan and Wendy by J.M. Barrie. This is the original Peter Pan story. We do not speak of Disney's contorted version, which, sadly was the only version I ever knew of growing up. Now, as an adult and a mother I have a new found interest in many children's literature that I was never exposed to as a child. And what a beautiful and wonderful world it has been to delve back into childhood and experience it anew with all these amazing children's stories and books. Tootles is inspired by my recent reading of J.M. Barrie's work and Pinker Bell is contrived from my own imagination and intermingling with the story. Tootles is one of the Lost Boys in J.M. Barrie's Peter Pan and Wendy. He is the most unfortunate and humblest of the Lost Boys, because "the big things" and adventures happen while "he has stepped round the corner". This, however, has not soured him. Instead it has sweetened his nature. He is the one who shoots Wendy in the heart with a bow and arrow after Tinker Bell (who was bent on mischief on the first night that she returned to Neverland) tells the Lost Boys that Wendy is a bird that Peter Pan wants killed. When Tootles realizes his mistake, he asks Peter Pan to kill him. Wendy however survives, and Tootles is spared. Though "he is clumsy and silly," Tootles is the first to defend Wendy when she wants to return home. When Peter Pan takes possession of "The Jolly Roger", Captain Hook's pirate ship, Tootles takes Smee's place as boatswain. At the end of the novel, Tootles along with the rest of the Lost Boys choose to return to London with Wendy. Tootles eventually grows up to become a judge. Tootles chooses to return to London with Wendy so that he may become a real boy who eventually grows up. But, in his heart, he will always be a Lost Boy from Neverland. After settling home, Wendy and Mrs. Darling (Wendy's mother) tried to teach the Lost Boys the way of the civilized world. Mrs. Darling had tailored some nice clothes for the boys to wear. After being cajoled into sporting a civilized look, Tootles decided he wanted nothing to do with nice clothing and all the fancy-schmancies. All he wanted was to be himself....sporting his old clothes and walking around barefooted. As a result, Wendy and Mrs. Darling could not do much more to force him into anything he didn't want to do. So, he stayed as he was. In Neverland, the Lost Boys "are forbidden by Peter Pan to look in the least like him." They are not to be named with a real boy's name like him. And there are so many other rules set by Peter Pan that forbid them many things. However, one thing they are free to do is intermingle with fairies. Sometimes, they may even have a fairy of their own, just like Peter Pan. As such, it turns out that Tootles has his own fairy and her name is Pinker Bell. Pinker Bell, as you can plainly see, is Pinker Bell because of her lovely pink hair and pink fairy wings. She is the only one of her kind, which makes her unique and distinguished from all the other fairies. Unlike Tinker Bell, who is haughty, hot-tempered, ill-mannered and plain grumpy and jealous, Pinker Bell has a much more pleasant and easy-going personality. She is often quiet, yet very protective of Tootles. She is not pretentious, but quite humble. She is lovely and awkward and silly just like Tootles, which is why she happens to be Tootles' fairy. Just as you find Tinker Bell is always around the corner to protect and defend Peter Pan, Pinker Bell too will never be found wandering very far from Tootles. The two are quite inseparable. 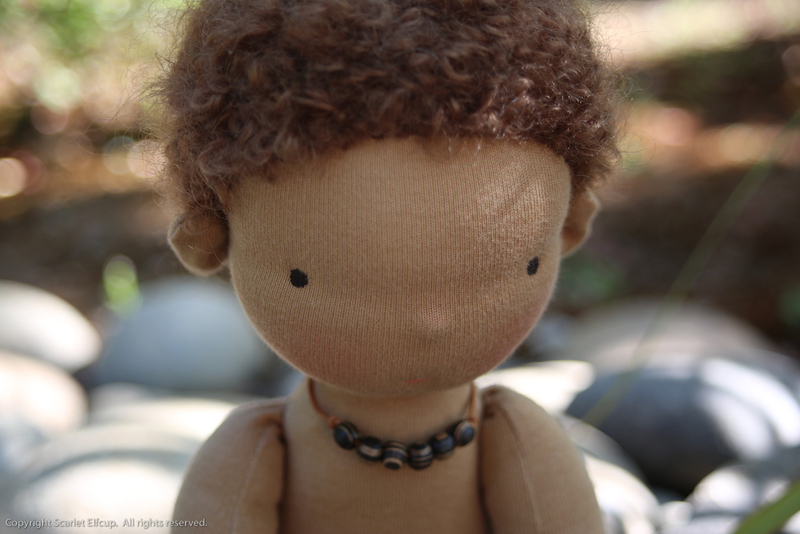 Tootles is a 13" doll, made with natural materials and he is a one-of-a-kind creation. He is made with premium quality swiss cotton interlock and firmly stuffed with bio-wool. His seams are sewn twice for reinforcement. 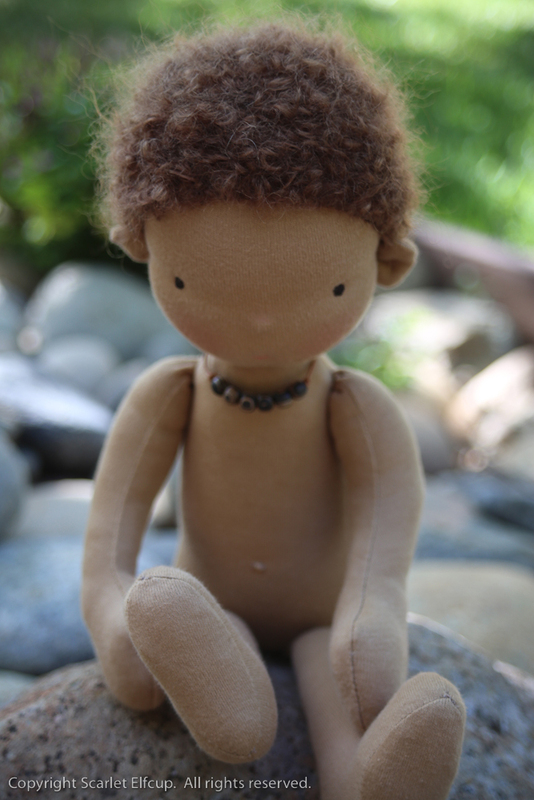 His hair is made of mohair yarn. 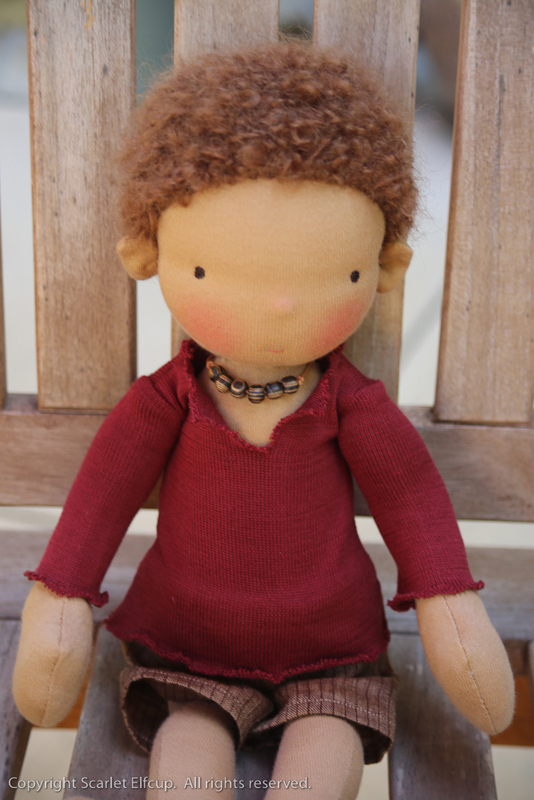 He has an embroidered and simple, expressionless face. His cheeks and nose are blushed with red beeswax. 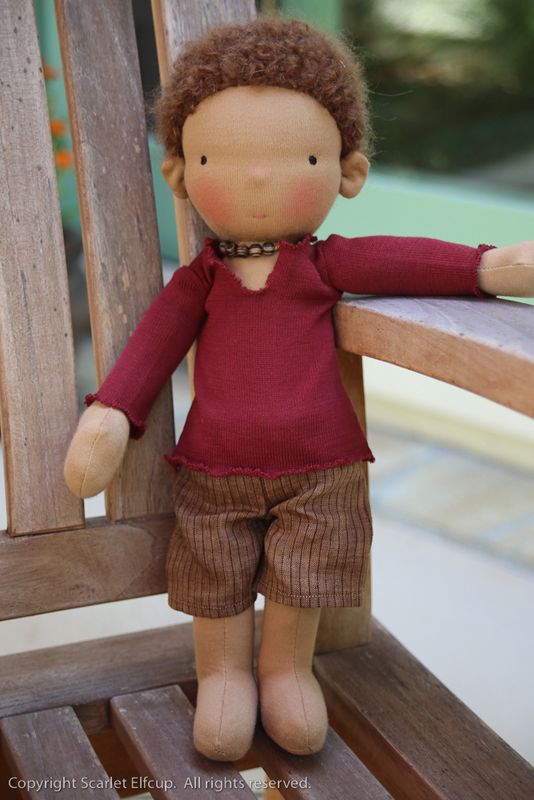 He is a sitting doll with legs that are sewn with lengthy fabric joints which allows full range motion for easy changing of clothes or for playful sitting positions. He has a sweet belly button and cute little ears. Tootles comes with a simple white cotton knit top and striped cotton shorts with patches sewn on. 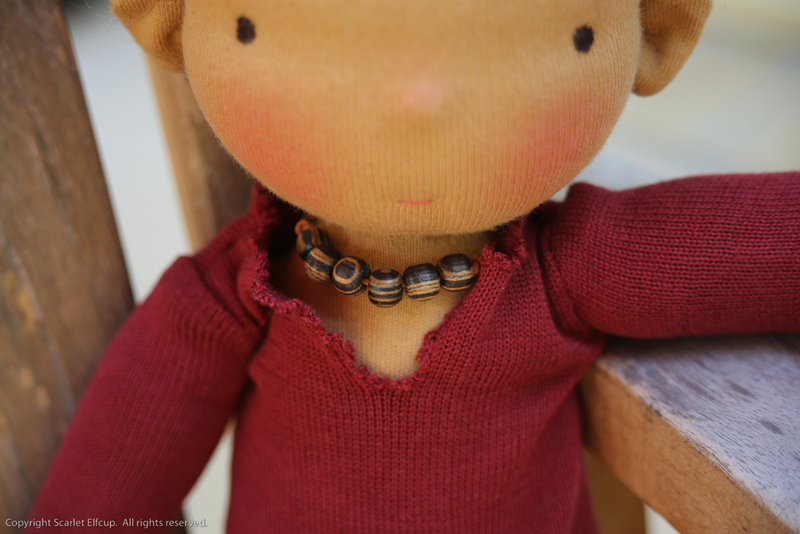 He also has a beaded necklace made with amber wood. He comes with a faux fur hat lined with sewn-on felt. Pinker Bell is made from Scarlet Elfcup's Gardien pattern. She is about 5" long. 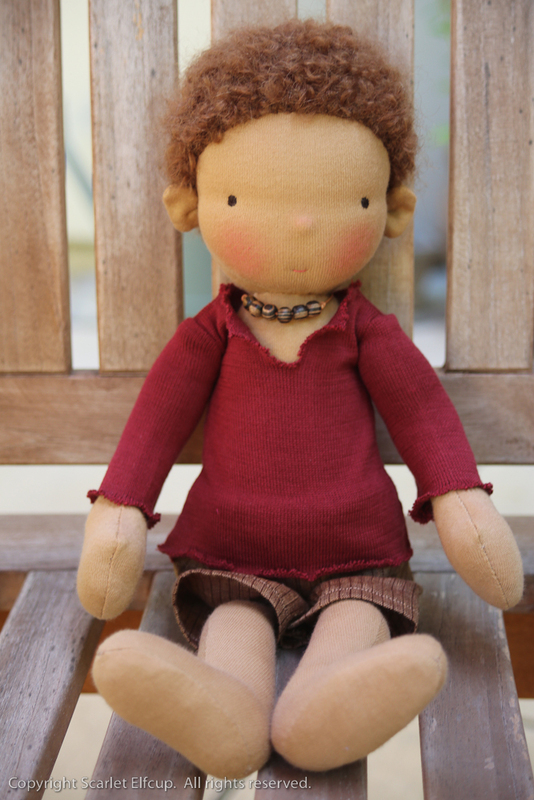 She is made with swiss cotton jersey and stuffed with bio-wool. Pinker Bell is stuffed less firmly than Tootles due to the miniscule nature of her pattern and size. 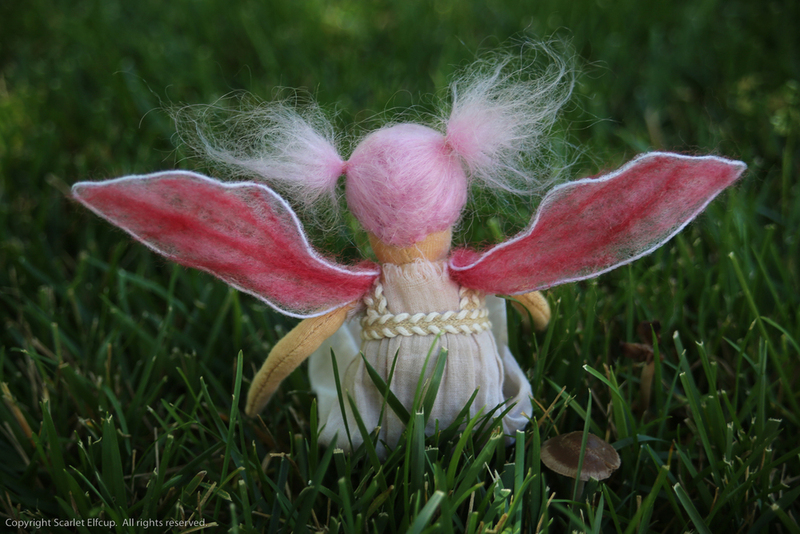 She has pink mohair yarn for her hair and an embroidered face. She comes wearing a light cotton fabric dress, roughly cut and crinkled to produce a woodsie effect. The raw edges are carefully razor-cut. The dress is sewn with a cotton trim for the A-line and straps and closes in the front with a nickel-free snap. 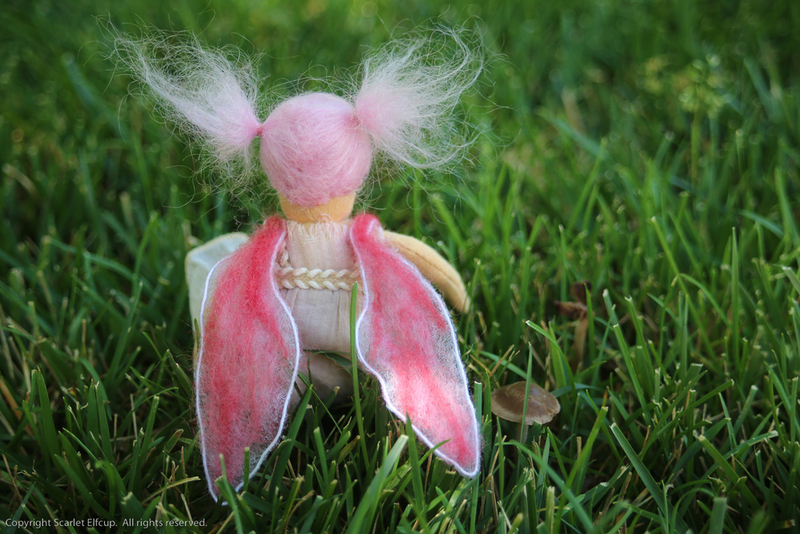 Pinker Bell has fairy wings made of fusible web needle felted with wool roving and shaped with floral wire. The wings are sewn onto her dress strap with live wires tucked away. Pinker Bell's dress/wings are delicate and require gentle handling. Tootles and Pinker Bell come as a set. They are recommended for ages 5+ due to the delicate nature of their design and the small parts on them. I have enjoyed creating these two in the hopes that they will find their way to a home where they can begin to weave lots of enchantment, imaginative play and memories for the wonderful years of childhood...or if you are like me...for the wonderful years of child-at-heart-hood. Tootles and Pinker Bell are now available for purchase in the Etsy shop. If you are interested in purchasing Tootles and Pinker Bell via the website, please complete and submit the form below. Their price is $155 USD. Purchases made through Scarlet Elfcup's website will be invoiced by PayPal and shipping fees will be waived. Form has been deleted. Tootles and Pinker Bell have found a home. Thank you.